The Air Car: A Bunch of Hot Air? My friend and fellow transit lover David Seitz sent me the cartoon on the right side. It is too funny not to publish, but too irrelevant to fuel an entire post. 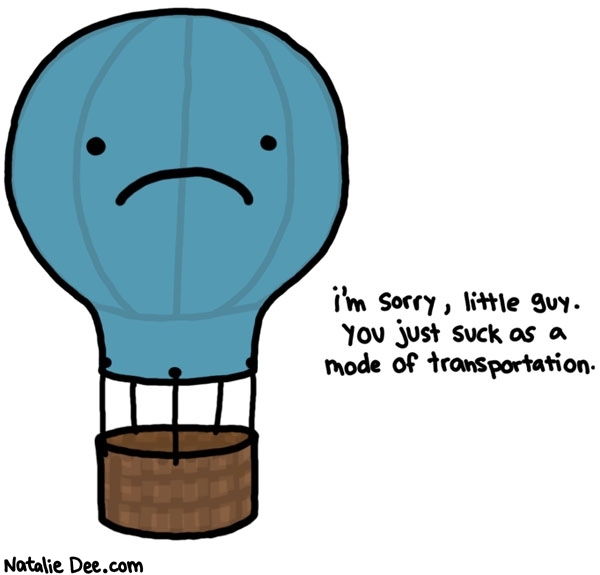 After all, I cannot claim with a straight face that hot air balloons are the future of travel. We’re not living in the time of Jules Verne! However, we are living in the time of Guy Negre, the founder and CEO of Motor Development International (MDI), which is marketing an air propelled automobile. MDI has been mentioned before on this blog. The company is creating engines that run on compressed air. The company has also developed dual-energy engines that have some alternative fuel source in addition and have greater range. The designs are fun (see above) and are incredibly eco-friendly. Seeing them makes me think of great, efficient urban travel. Currently, when I see smart cars, they make me smile. They’re tiny, fuel-efficient, fit into just about any parking space, and still manage to haul the groceries. The Air Pod could work the same way, except without fossil fuels! While MDI is at the forefront of the air engine movement, there are a few other companies as well, such as Engine Air in Australia. I am not claiming that air pods are a total solution, but there is no reason they cannot be part of one. The Air Pod which runs on compressed air only is expected to travel about 220 km with the following features. I personally hope MDI succeeds and we end up seeing air cars on the road. They are a great idea, better than hot air balloons (though perhaps not quite as much fun). For all those people already thinking about getting around urban areas on mopeds or in Smart Cars or other similar vehicles, this is an even more eco-friendly solution. Yonah Freemark (of the Transport Politic, see my blogroll) posted a fantastic cumulative response to Edward Glaeser’s lackluster and academically dishonest essays on high speed rail at the Infrastructurist. Freemark performed the first comprehensive analysis that incorporated real data. He challenged Glaeser’s basic assumption and his calculations. Here is the data Freemark used in pdf format. Here are some of the highlights from Freemark’s insightful and devastating response to Glaeser. Glaeser argues that a Houston-Dallas line would be roughly one-half as popular, relative to population, as the current slow Amtrak service is in the Northeastern Corridor. His reasoning is that both Dallas and Houston are less transit-friendly areas, and therefore less conducive to train travel. So, assuming a 50 percent lower per capita ridership rate, he comes up with 1.5 million annual customers for the line – this is similar to the number of people who currently fly directly between the two cities. There are a number of major flaws with this approach though. First, while transit-friendly conditions are desirable – and it bears mention that both Dallas and Houston are expanding their transit systems significantly – there is little evidence those networks are vital in attracting customers to high-speed rail. The reduction in carbon emissions from people choosing not to drive cars or fly airplanes would be quite significant – especially if the rail system is powered by renewable energy. These savings are particularly evident on the very short flights on this corridor, such as from College Station to Houston or from Waco to Dallas, which could be replaced entirely with rail service. Glaeser argues the power plants that produce the electricity used by high-speed trains would produce significant carbon emissions, reducing the environmental gain from switching away from air or car travel. Yet he fails to account for the green potential of an electric rail line: it can operate without releasing any carbon at all. California, which is developing a 220 mph line between San Francisco and Los Angeles, has pledged to run its trains with electricity obtained only from carbon-neutral sources, such as wind turbines and solar panels. Texas could make the same commitment and dramatically expand the environmental benefits of the high-speed system. Texas is uniquely positioned to build such facilities, too – its western and northern sections are sunny, windy, and sparsely populated. Rather than looking at Glaeser’s hypothetical 240-mile rail line directly and exclusively between Dallas and Houston, I’ll base my argument on a line actually under consideration called the Texas T-Bone that would run roughly 300 miles between the cities, with intermediate stops at Waco, Temple, and College Stations. For simplicity’s sake, in this piece I’ll ignore the roughly 140-mile proposed extension of the line south to Austin and San Antonio but factor in connecting slow-speed trains from those locales. Rhode Island: Only because the state is so tiny, the state has a public transportation system – RIPTA – that serves the whole state, not just a region. The trucking and shipping industry loses $20 billion every year due to congestion. That cost is passed on to customers. It is cheaper and more environmentally friendly to run a truck at 55 mph moving down the highway on a toll lane than having it sitting in traffic. With tolls bearing some of the cost to construct and operate new highways and bridges, funds from traditional revenue sources may be made available to invest in mass transit, the construction of non-toll highways, and the maintenance of existing infrastructure. Texas: Continuing my fascination with transportation videos, here is an explanation of lemon law in Texas. For all of my readers in Texas, please get the free “Don’t Mess with Texas” litter bags! Utah: The state DOT has their own YouTube page. Watch below to see the 4500 South Bridge move down the street, literally. Vermont: Vermont is of course home to Amtrak’s Vermonter (which all I know about it is that it is chronically late in New York). Apparently the Vermonter can be taken between in-state stops for $12. 1923: A three-cent-per-gallon gasoline tax is enacted to produce revenue for road construction. Voters defeat a bond issue for road construction, favoring a pay-as-you-go method. 1959: The state’s first interstate segment is opened – the Interstate 95 bypass of Emporia. 1988: Legislators allow private companies to build and operate for-profit toll roads. Plans for the first such facility – an extension of the Dulles Toll Road – are approved by the Commonwealth Transportation Board (CTB) in 1989. Reducing weekly car travel by biking, walking, skateboarding, busing or carpooling. West Virginia: 226 million tons of freight are carried by rail in West Virginia each year. The state is home to a variety of rail tours, including the Potomac Eagle. Wisconsin: The state DOT runs a forward-thinking program to get people to commute via bicycle by setting up bicycle buddies to travel together, pairing riders of similar skills. Wyoming: The picture at the beginning of the post is of the Chief Joseph Scenic Byway, the state is home to numerous other gorgeous highways (as there is little public transportation, appropriately, in Wisconsin). As per usual, the Transport Politic has provided an innovative insight into the world of transportation. This week he has developed a Senatorial Transport Index for 2009, measuring how progressive senators are regarding transportation issues. For further explanation of how these ratings were measured you should click on the link to get the breakdown of what votes were measured. What is interesting to me is the curious correlation or lack thereof of votes to urban density. I understand the role of party affiliation and how that affects the votes of various senators, but states with high urban density are most likely to get federal public transit funding, especially regarding high speed rail. It makes all the sense in the world that the senators from Wyoming do not support such funding, but that the senators from Texas are lukewarm is odd; especially given that the state is home to three of the eight largest cities in the country (Houston, Dallas and San Antonio) and six of the 21 largest. The truly perplexing state is Arizona, given that 81.4% of it’s population lives in the Phoenix and Tuscon metropolitan areas. However, Phoenix is built on the American dream of sprawl, roads and now foreclosure. At the same time, only politics can explain the “good” behavior of the senators from Montana, Vermont and West Virginia. Although we can all hope that senators truly have the nation’s best interest at heart and realize that what is good for the country may be good for their constituents, even if the money does not flow directly.